State of Emergency in Peru… and where have all the bananas gone? | Small Farmers. Big Change. State of Emergency in Peru… and where have all the bananas gone? Tomorrow, March 1st marks the beginning of Banana Month at Equal Exchange! All month the blog will be full of videos, reports, and photos from our various trips visiting our banana partners in Peru. Everyone here is excited to share these beautiful, informative, and fun stories that we’ve been preparing and collecting. It’s our way of sharing the hard work our banana team, farmer partners, and retail partners have been doing this past year. There will also be promotions going on in many of the stores that carry our bananas. This is also our way of showing appreciation to all of you who have been supporting us as we try to build a small farmer banana supply chain in which we can all feel proud and inspired. Unfortunately, just as the kick-off promotion was about to get started in retail stores across the country, our two banana farmer co-op partners in Peru, APOQ and CEPIBO alerted us to some very difficult news. As you can see from the map below, last week many areas of Peru were hit with some of the worst rainstorms the country has experienced in the past 50 years. 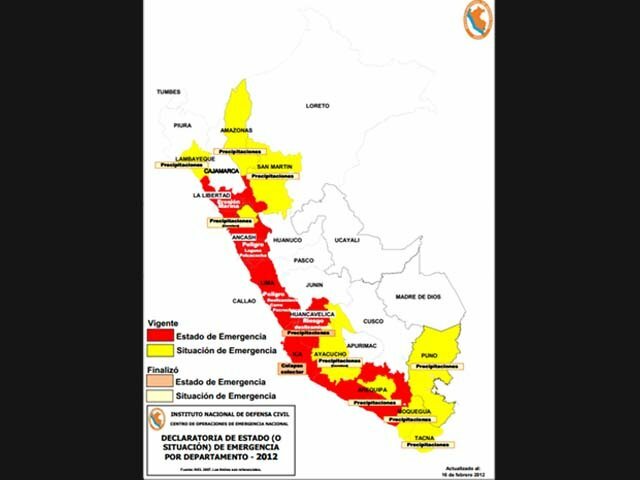 The government has declared a state of emergency throughout parts of northern, central, and southern Peru. Between the heavy rains and subsequent flooding, thousands of hectares of banana, mango and rice production, as well as crops being grown for the local food market, have been destroyed. The mango harvest was entirely wiped out, while banana production is down by 50%. The northern desert area typically receives little rainfall and the soils aren’t accustomed to the heavy storms which saturated the area. Many banana plants are suffering from “Mancha roja”, a red-spotting disease that affects the plants when there is too much moisture, making the bananas unsuitable for the export market. In addition to this loss of fruit, many roads have become impassable, preventing the co-ops from getting the fruit out of the farms. We will keep you posted about the situation in Peru as we learn more. What does this mean for those of us in the North? The market for organic bananas is tight everywhere right now. This shortage of supply has driven up prices and is making it difficult to find enough bananas to fill all the orders we are receiving from our grocery store partners. Clearly this is frustrating for our retailer partners, especially as they had planned to join with us in promoting the bananas this month. It is also hard on our banana team who have worked so hard to bring these fairly traded small farmer bananas to all of us. So, please be patient with your grocery produce staff if they are short bananas and be especially kind to our banana team, Nicole and Jessica! Stay tuned and keep on supporting authentic fair trade.